With O.M.A.C. 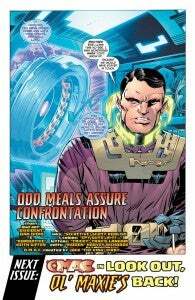 shuttered at the start of DC Comics' second wave of New 52 titles, Maxwell Lord and Checkmate have been lacking a home for a while. Well, now it looks to us as though he's likely to end up in Justice League. After saving Steve Trevor's life, and before locking lips with Superman, Wonder Woman visits her former lover in his hospital room, has a heated exchange with him, and then informs him that the League has asked for a new liaison. This has two effects: Not only does it give Trevor plenty of anger to work with while putting together a Justice League of America team that's intended to take his mind off the fact that his dream girl dumped him for one of the half-dozen guys on the planet he can't beat up, but it also vacates the position of "Justice League liaison," a role that Maxwell Lord has historically felt pretty comfortable in. He's right there, after all...! Plus, both Batman and Cyborg have been interacting directly with O.M.A.C. following his deactivation at the hands of Booster Gold and his "Skeets protocols." We see Vic Stone's father tending to Kevin Kho, followed by Batman telling him that he'll try to get Cyborg's opinion on how to keep Brother Eye out of the picture. 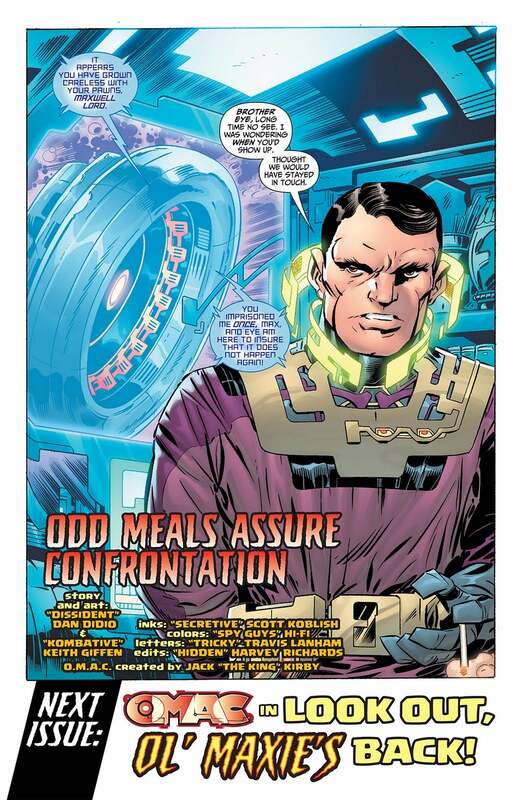 This would sync up pretty nicely with that image seen in the back of Justice League #12, where Batman and Cyborg are in what looks like a room full of computer monitors, realizing that the League has a traitor. If O.M.A.C. has been defeated and taken into custody, it's hard to imagine a scenario where Max Lord isn't on premises somewhere. This may be stretching things a bit, but it seems pertinent. Just before vacating Kevin Kho's body during the battle with Booster Gold, O.M.A.C. tells the hero, "Eye will remember this, Michael." 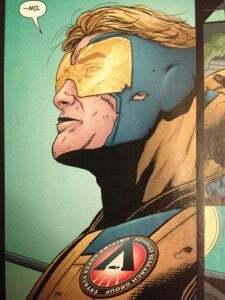 It's eerily reminiscent of Justice League: Generation Lost, when Maxwell Lord (as the series villain) was constantly calling Booster Gold "Michael." In the rebooted continuity, it wouldn't make a lot of sense, considering that as far as we know the pair have no history together...but it's hard not to notice that hint, especially when Johns employed a similar technique during 52, when the way the possessed Skeets referred to Booster had meaning in at least a couple of sequences. So, the upcoming Trinity War story seems to be pitting the Justice League against the Justice League of America. The Justice League of America--that's the team that the older Booster in the Time Master armor told his younger self to seek out for help--will be led by Steve Trevor, who works with ARGUS. There's no guarantee that there will be any kind of inter-departmental rivalry between Trevor and his replacement, but it seems like a safe bet. Meanwhile, the older Booster is wearing an ARGUS badge. You guess is as good as ours as to exactly how he fits into all this, but it seemed like it could be important. Given that Checkmate had an adversarial relationship with S.H.A.D.E., after all, it stands to reason that similar organizations like Stormwatch or ARGUS might also be considered a threat or a competitor for Max's organization, right? And if so, what's to stop him trying to take out folks (like the JLI) associated with the competition?